What fun! I put these pretty purple decals on Millie. They are so much fun I ordered more for my DSM and my fabric stash cabinet. They're available at www.quiltastick.com. You can pick your own colors or custom designs too. cool !! like the purple! Frogger and Toad are tattoed also! Super cute, I have to check those out! I got them at urban elements. I've often thought I should get a tattoo. I've always thought a goldfish tiny cracker would look great on my pinkie toe. You know those orange ones from pepperidge farm? It's the right shape and everything! Meg, I love tattoos too. I got one many years ago, a small rose on my ankle. I'd like more, but I just can't decide what or where. Maybe someday I'll draw/quilt a design that I just love and that will be it. 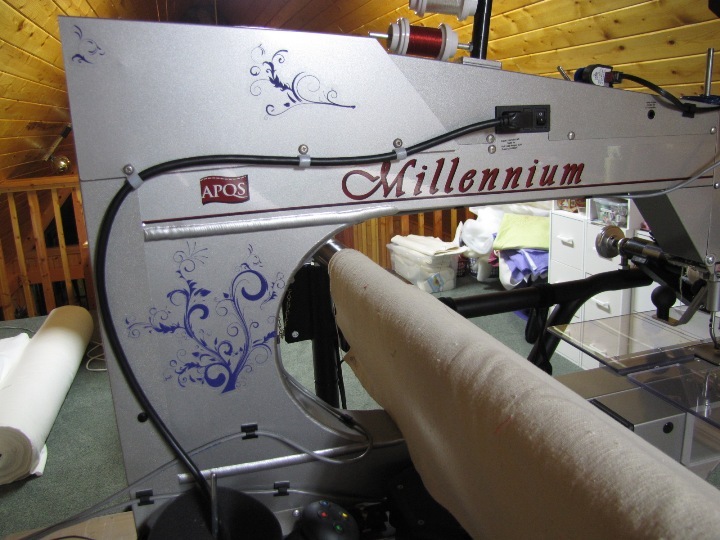 I would love to have a copy of the tats Karen McTavish has on her arms on the side of my Millie for inspiration. My students used to tell me they were going to get a tat! I told them it was like putting on underwear today and 15 years from now having on that same underwear! I have had at least one student come back to tell me I was right as she was saving money to have her removed. Now, Stitch is different! She might could use a tat or two! If you know someone with one of those scrapbooking cutting machines--Cricut, Silhouette--you can make your own--I just have to come up with the design and my DD will cut them out for me. I am going to design it in AnS--save as a DXF file then email it to her and she can just send it to her machine and cut it. Love the tattoos!! Would love to have some for my Lenni!! I almost got a tattoo~then DH & I watched the show about Tatts that have been done wrong or someone changed their mind and they showed what having them removed intailed~Now I will ONLY get the temporary ones!LOL!! Millie's tats are pretty, Annie! No needles involved in her tats...hence the reason I don't have tats. Those look awesome! Think I need to check that site for some pretty tats for Lenni . I have a Cricut and don't know how to get it to work with Windows 7 and accept DXF. Karen--I should have explained myself a bit better--my DD has the Silhouette--and you can draw your own designs for that cutting machine--the Cricut will only accept designs from Cricut cartridges. But there might be some neat designs from Cricut--I am just not familar with them. I want a tattoo!!! Those are great; gonna go check them out!! Has anyone with a Cricut found a cartridge that has quilt blocks? I want to cut out some quilt blocks on the adhesive vinyl and put them on the risers of my stairs. I've seen lots of painted stairs with stickers on the risers and they look pretty cool. I want quilt blocks on mine. My husband has a vinyl cutter that he uses for people that want lettering on their cars or attached with heat to a shirt (when the only want one and screen printing would be ridiculous). I never thought of having him make whatever design I come up with--how cool is that!!! As far as real tattoos go--I've often contemplated getting one, but I can't think of anything I like that I would want to be stuck with permanently. I love the underwear analogy!! I got a tattoo when I was 21. It was cool for a while, but definitely like wearing the same undies for 15 years, only in my case, longer. Very sorry I did that. Thankfully I don't see it often as it is on the back of my shoulder. Now for Millie, I think she would look lovely with a tat. Thanks for sharing. it more smooth and less noticable, don't know, but would hate to have it removed..
LOL, have it removed and get another to cover the scarring. 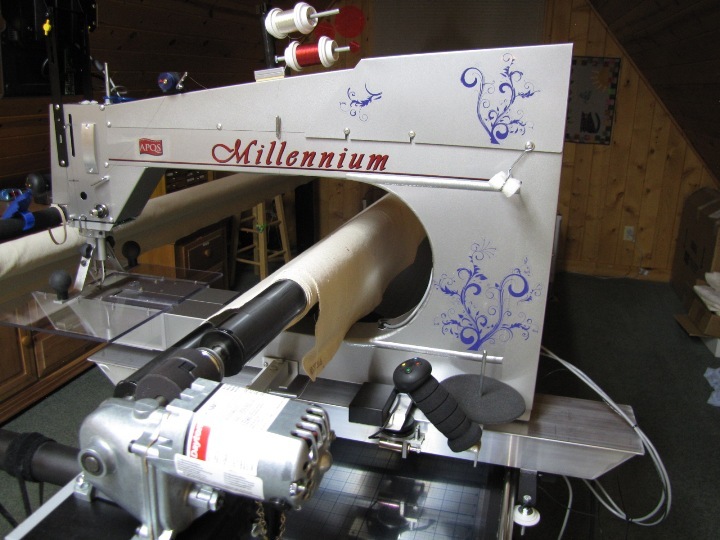 Love the idea of tatting Millie - thanks for sharing!